Cytochromes are heme-dependent enzymes of immense importance across all kingdoms of life. Due to their often highly promiscuous nature, the cytochrome P450 superfamily is of particular interest in context of enzyme engineering. In this subproject, we aimed at applying our PREDCEL toolbox for re-directing the catalytic activity of cytochromes towards desired products. Employing the caffeine-metabolizing human Cytochrome P450 1A2 (CYP1A2) as example, our team implemented a PREDCEL enzyme evolution workflow coupling phage survival to the production of a naturally unfavored catalytic product: theophylline. We created M13 phages encoding CYP1A2 as well as a corresponding accessory plasmid linking the intracellular theophylline levels to geneIII production via a theophylline riboswitch. After iterative propagation of the CYP1A2-encoding phages on mutagenic selection cells transformed with our accessory plasmid, we observed numerous, partially recurrent point mutations in CYP1A2, indicative of a successful evolution. Taken together, our work lays the foundation for the future engineering of enzymes by means of in vivo directed evolution with PREDCEL. Enzymes, i.e. proteins mediating specific, catalytic functions, are amongst the most powerful molecular machines invented by nature. Since decades, humans utilize naturally occurring enzymes as bio detergents (e.g. in washing powder kirk2002industrial), in the paper industry bajpai1999application and for food processing alkorta1998industrial. The engineering of novel enzymes catalyzing reactions that do not or only inefficiently occur in nature holds great promise for biotechnological production of regenerative fuel, biomaterials and novel pharmaceuticals, e.g. based on Organosilicons. However, so far, enzyme engineering has typically been a time-consuming, elaborate, expensive and inefficient process, usually requiring laborious, iterative trial-and-error optimization of engineered candidates packer2015methods . To accelerate the development of novel enzymes, our team harnessed the engineering strategy nature uses: Evolution. The evolutionary circle starts by M13 phages injecting their genome (SP) into bacterial cells, already containing two additional plasmids, AP and MP. The SP encodes CYP1A2 among genes (except geneIII) that are crucial for phage propagation. If through MP activation mutations in the CYP1A2 gene lead to improved CYP1A2 variants the intracellular level of theophylline increases. Theophylline molecules activate the theophylline riboswitch on the AP and thereby enhance geneIII expression. The assembled phages containing the improved CYP1A2 variant can leave the cell and propagate by infecting new cells. The human Cytochrome CYP1A2 is an example of a heme-dependent-thiolate monooxygenase, member of the P450 superfamily and plays an important role in the metabolism of many structurally unrelated substrates. Primarily the CYP1A2 is located in the endoplasmic reticulum of liver cells. It is of great interest as it is involved in the oxidative metabolism of many commonly used therapeutics and xenobiotics ahn2004high, such as caffeine. Caffeine undergoes degradation by CYP1A2 through an initial N3- demethylation into three xanthine derivates, 81.5% paraxanthine, 10.8% theobromine and 5.4% theophylline perera2010caffeine. The chemical structure of these three primary metabolites of caffeine (Fig. 2) only differ in their methylation pattern (Fig. 3). Caffeine is a substrate of CYP1A2 perera2010caffeine. By N3 demethylation caffeine is metabolized into these three xanthine derivates by CYP1A2 perera2010caffeine. Our evolution circuit for cytochrome engineering works as follows: Bacteriophages infect bacterial cells by introducing their genome. The genome encodes a Selection Plasmid (SP) that contains the human CYP1A2 variant and all necessary components for phage propagation except geneIII. The Accessory Plasmid (AP) codes for geneIII driven by a Psp-tet promoter and contains a riboswitch, located between the promoter and geneIII, which regulates the expression rate of geneIII. The riboswitch on the AP is only active if theophylline reaches a certain concentration within the bacterium. If CYP1A2 is active, caffeine is converted to theophylline. Gradually the theophylline concentration increases and acts upon the riboswitch, which enables expression of geneIII. Additionally, the AP encodes for the chaperone HDJ-1, which is essential to receive the functional CYP1A2 enzyme (Fig. 1). 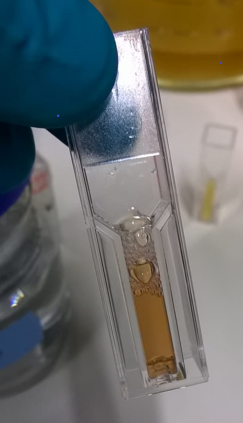 After the addition of sodium dithionite to the E.coli cell lysate (expressing CYP1A2) a color change could be detected as the solution turned darker/brown. Before we could start to evolve the CYP1A2 we first checked whether the enzyme can be expressed in its functional tertiary structure in our E.coli strain. CYP1A2 requires a heme group as cofactor which coordinates iron ions. A fast test using sodium dithionite can be conducted to proof whether the CYP1A2 is properly folded. Thereby sodium dithionite acts as a reducing agent and can be used to quantitatively detect iron ions in aqueous solutions. When sodium dithionite is added to the cell lysate of E.coli cells expressing CYP1A2 and the corresponding chaperone protein HDJ-1 a color change can be detected even by the eye (Fig. 4). Further OD measurements at 550 nm will show a peak, indicating the reduction of iron ions by sodium dithionite kan2016directed. The applied PREDCEL workflow is described in general in the PREDCEL Protocol. However, we had to conduct some adaptations for a successful PREDCEL run: Once the culture is grown up to an OD600 of 0.6, the Mutagenesis Plasmid was activated by exchanging the initial medium containing glucose (repressing the MP) by medium containing arabinose. Then the culture is inoculated and incubated for three hours to propagate the phages before the supernatant containing the phages is transferred for the first time. After three rounds of passaging, the obtained phage supernatant is used to infect another E.coli strain, ensuring fast propagation of phages without selection pressure over night. This intermediate step prevents a phage washout and ensures a sufficient phage titer that is needed for the inoculation of the next PREDCEL culture. This procedure has to be repeated after each round until the evolution process is completed (Fig. 5). To get to know more about on how phage titers behave under different conditions, have a closer look on our Modeled Phage Titers. The optimized PREDCEL procedure starts by the initial inoculation with phages carrying CYP1A2. After three hours of incubation the phage supernatant is transferred and inoculated with a fresh PREDCEL culture for three hours. While phage variants with beneficial mutations develop over several transfers, the phage concentration in the flask decreases gradually. To prevent phage washout after only a few rounds of selection and mutation, the last phage supernatant of the day is used to inoculate an over night culture for phage enrichment. The next PREDCEL transfer can then be started with a sufficient phage titer of phage variants carrying the best mutations at this point. By following this protocol, more PREDCEL rounds can be conducted consecutively enabling further optimization of the CYP1A2. In a first step, we wanted to validate our AP. Therefore, we added theophylline with a concentration of 100 µM to our inoculated culture and performed two rounds of PREDCEL. Afterwards, we determined the phage titers by plaque assays. 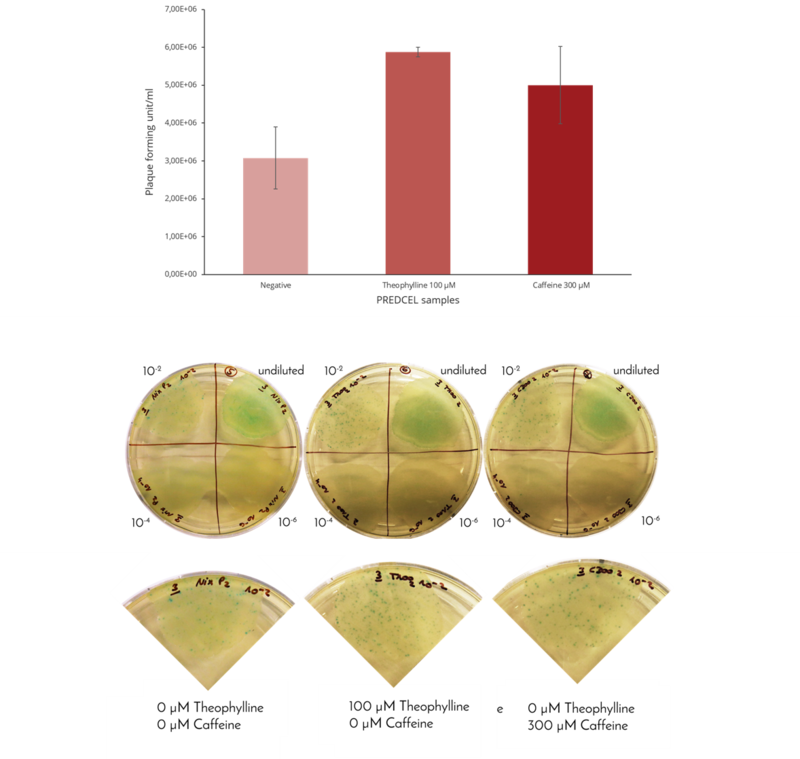 Our theophylline treated culture displayed approximately two times higher phage titers than the non-treated control culture indicating that our riboswitch selectively binds theophylline and is thereby activated. Using the same experimental conditions, but replacing the theophylline treatment by a 300 µM caffeine treatment, we verified the functionality of CYP1A2 and thus of our SP. If caffeine is added to the culture, CYP1A2 catalyzes the reaction from caffeine to theophylline. The resulting increase of the theophylline concentration further activates the riboswitch on the AP and phage propagation is stimulated (Fig. 6). For the evolution of proteins via PREDCEL the addition of a Mutagenesis Plasmid (MP) is essential. For our cytochrome engineering approach we have chosen MP4, which induces a medium mutation rate badran2015development. After six iterations of our optimized PREDCEL workflow, we performed plaque assays and sequenced single plaques. The sequenced plaques showed five recurrent mutations demonstrating that we are able to induce mutations with our experimental setup and that we are able to evolve enzymes (Fig. 7). Plaque assays performed after two passages of CYP1A2 PREDCEL with either adding 100 µM theophylline or 300 µM demonstrating the functionality of the Accessory Plasmid and the Selection Plasmid, respectively. Adding theophylline increases the geneIII expression 2-fold. Adding caffeine enhances the conversion of caffeine by CYP1A2 to theophylline and thus increases the geneIII expression as well. Sequencing results of eight plaques after 6 iterations of the PREDCEL workflow with MP4 illustrating recurring mutations of the CYP1A2 gene. Recurrent mutations with amino acid exchange are indicated in red, without amino acid exchange in orange. Single mutations with amino acid changes are shown in yellow, and without amino acid changes in blue. Cell lysates were used for high-performance liquid chromatography to distinguish theophylline (left peak) from caffeine (right peak). This assay allows a quantification of the educt and the product of CYP1A2 and thus a conclusion about the conversion efficiency can be made. Typically enzyme engineering is a very time consuming and challenging process. By using our optimized PREDCEL workflow, we were able to evolve the human cytochrome CYP1A2 by directing its catalytic activity towards a higher conversion of caffeine to theophylline. Remarkably, already after a few rounds of PREDCEL, we received recurrent point mutations, indicating that our new approach is strongly efficient and highly accelerates the evolution of enzymes. As plaque assays take a lot of time, we additionally developed another approach to investigate the CYP1A2 activity. Therefore, we used a high-performance liquid chromatography to distinguish between the educt caffeine and the product theophylline from cell lysates and to quantify their concentrations while running PREDCEL (Fig. 8). We are confident, that our PREDCEL workflow expands the possibilities of protein engineering and can be applied for various beneficial enzymes.